Sound "From the deepest registers through the midrange and into their extended highs, the F12s are exceptionally even throughout. Nothing in their sound jumps out." "You get the truth from these speakers." "The F12s didnt show the slightest bit of strain as I turned the volume up. Instead they easily kept pace with the music, and remained composed at levels into which one never need venture." is a large three-way floorstanding speaker.... The driver complement consists of a 1" "Organic Ceramic Composite (OCC) dome tweeter, a 5 1/4" midrange driver featuring a die-cast frame, and two 8" OCC woofers also housed in die-cast frames. The design uses a high-order crossover in which the tweeter hands off to the midrange driver at 3.0kHz and the woofers take over at 575Hz." Use "I was uncertain if the pair of 8" woofers employed by the F12s would cause the bass to sound bloated or congested in my room. I ended up positioning the F12s 36" in from the side walls, 30" from the front wall, and 60" apart. In this location, I heard nothing but deep, well-controlled low frequencies." Value "The fact that they retail for $1198 per pair makes them an excellent value and a good option for those of us on a budget." I have a passion for high-end audio. More specifically, I have a passion for affordable high-end audio. However, being interested in budget audio was not a conscious decision on my part, but rather a self-imposed limitation: I was still a college student when I bought my first system. In hindsight, I think I was lucky to have developed an interest in this hobby while I was still in school. I learned that if one does his or her research and takes the time to audition different products, it is possible to build a musically satisfying system at a reasonable price. I suppose this is one of the most appealing aspects of high-end audio to me. Therefore, I was happy to receive the e-mail informing me that I would be reviewing Revel's newest floorstanding speaker, the Concerta F12. I had never listened to a Revel design before, but I was well aware of the accolades the company's Ultima and Performa loudspeakers have received in the past decade. Given these speakers' higher price, it was never within my means to even consider buying them. It was probably in response to consumers such as myself that Revel decided to introduce the Concerta series, which is the company's attempt to bring the same design principles employed in its more expensive offerings to customers with more restricted budgets. In some ways, this presents a much greater challenge than designing a flagship speaker. With tighter margins, compromises inevitably have to be made in terms of materials and components. As you will read, Revel has discovered a clever balance and built a speaker of remarkable sonic quality. Harman International formed Revel in 1996. Because Harman is a large company with many resources at its disposal, an all-star cast of people were brought together to develop the Revel line. This included Floyd Toole and Kevin Voecks, both of whom value rigorous scientific evaluation in combination with blind listening tests. With the financial support of Harman, Revel has access to facilities that enable Toole and Voecks to carry out thorough testing and evaluation of their products. This includes three anechoic chambers and a room for blind listening tests. The latter uses mechanical platforms to move speakers back and forth so that each speaker is positioned at the same location for evaluation. In this way, variations in sound caused by speaker placement are eliminated. In these tests, not even the person switching the speakers knows which is playing. While there are those who believe blind listening tests are of little value, I would argue that only when one's preconceptions are set aside (through knowledge of what type and brand of speaker is playing) can one drop his or her biases and simply focus on the sound. The Concerta F12 ($1198 USD per pair) is a large three-way floorstanding speaker that measures 42 3/8"H x 9 3/4"W x 14 3/8"D and weighs 63 pounds. The driver complement consists of a 1" "Organic Ceramic Composite (OCC) dome tweeter, a 5 1/4" midrange driver featuring a die-cast frame, and two 8" OCC woofers also housed in die-cast frames. The design uses a high-order crossover in which the tweeter hands off to the midrange driver at 3.0kHz and the woofers take over at 575Hz. All drivers are magnetically shielded to enable placement close to a video monitor. Of particular note in this design is Revel's use of proprietary Constant Acoustic Impedance (CAI) waveguide technology in the tweeter assembly. Revel claims that the CAI waveguide serves to provide ideal acoustic loading over the frequency range of the tweeter as well as optimized horizontal and vertical dispersion to match that of the midrange in the crossover range. While the waveguide tweeter appears in other speakers in the Concerta line (including the M12 monitor, S12 surround and C12 center-channel speaker), it is also used in the two newest members of Revel's Performa series, the F52 floorstander and C32 center-channel. Perhaps we can expect to see the waveguide in more of Revels future designs. Frequency response for the F12 is said to extend from 58Hz to 18kHz +/- 1dB. The lowest frequencies are reportedly down 10dB at 28Hz. Sensitivity is rated at 90.5dB/W/m and impedance is given as 6 ohms. In short, the F12 is billed a sensitive design that is extremely easy to drive. Except when I was testing the dynamic abilities of this speaker, much of my listening never found the dial on my integrated amplifier beyond the 9:00 position. The speaker cabinet is constructed of MDF, and internal bracing is added to reduce unwanted resonances. The F12 is finished with a faux-wood vinyl that is available in cherry, maple or black. The review pair was supplied in cherry. I was very impressed with the build quality of the F12s. The cabinet felt extremely solid, and the vinyl finish was very attractive. The pair of sturdy binding posts accommodates both banana plugs and spades, and facilitates biwiring or biamping. My biggest concern when I unpacked the F12s was their size. My listening room measures 16'L by 12'W and has a 7 1/2" ceiling. Although it provides the perfect environment for the PSB Image 4T speakers that I use as my reference, I was uncertain if the pair of 8" woofers employed by the F12s would cause the bass to sound bloated or congested in my room. I ended up positioning the F12s 36" in from the side walls, 30" from the front wall, and 60" apart. In this location, I heard nothing but deep, well-controlled low frequencies. In fact, even when I really cranked up the volume, the bass never obscured what was happening in the music. I used the F12s with an NAD C372 integrated amplifier and the NAD C542 CD player. AudioQuest Copperhead interconnects were used, and 14-gauge Ultralink speaker cables terminated in banana plugs fit snugly into the F12s' binding posts. All of my listening was done using only single wiring. Because I liked the appearance offered by the contrast between the gray woofers and the black cabinet front (as with the Performa series), all of my listening was done with the grilles off. My initial impression of the F12s' sound was of its balance. From the deepest registers through the midrange and into their extended highs, the F12s are exceptionally even throughout. Nothing in their sound jumps out. As a result, there wasnt a CD in my collection that didnt sound good on the F12s. These speakers never called attention to themselves by emphasizing any part of the audible spectrum, unless that emphasis was in the recording itself. An example of this was Joni Mitchell's Hits compilation [Reprise CDW 46326]. This HDCD-encoded disc offers an excellent chance to see how well speakers can portray vocals. On the first track, "Urge for Going," Mitchell's voice sounded very natural and her position was solidly between the two speakers. When I closed my eyes, all that remained was the sound of her voice and the crisp notes being coaxed from the strings of her acoustic guitar. Altogether this offered a very intimate performance of the song. The vocals were not forward, but rather in balance with the sound of the guitar, providing for a convincing presentation. However, on a track such as "River," Mitchell's vocals were a bit more up-front, and her piano seemed to fall back a little in the mix, almost as if to call more attention to the lyrics than the piano. The Revel F12s do not add anything of their own to a recording. If a song emphasizes vocals, this will easily be heard. In contrast, if voices are more laid-back, the F12s will convey that. You get the truth from these speakers. I noted that in the Joni Mitchell album, image placement was very strong. This was even more apparent with A Feather on the Breath of God: Sequences and Hymns of Abbess Hildegard of Bingen [Hyperion CDA666039]. This 1980 recording was made at the Church of St. Jude-on-the-Hill in Hampstead, London. Other than the exquisite singing that permeates each track, I particularly like the album's ability to transport me out of what is a small listening space and into what I imagine to be an enormous cathedral. On the second track, "Ave Generosa," Margaret Philpot's voice fills the church and gives the listener a clear sense of the massive space that surrounds her. Again, with my eyes closed, the F12s took me into that space. The ability of the F12s to re-create an enormous soundstage was not limited to albums recorded in churches. On Radiohead's Kid A [Capitol 27753] the listener isnt in a medieval church, but rather part of a science-fiction odyssey. The album has an almost haunting quality on some tracks, while it is chaotic on others. During the title song, Thom Yorks voice is altered to give the impression that a computer or some other machine is communicating its thoughts. The music washes over the listener and floods the room. Through the Revels, all of this was clearly communicated. The drone of the bass did not obscure anything else happening in the music, and sounds remained distinct and separate in space, creating an incredibly deep and immersive soundstage. On the song "Idioteque," the tempo is unusual. There is an overwhelming sense of chaos and panic as the songs urgent pace gives the impression that something of extraordinary (and disastrous) proportions is taking place. The F12s reproduced this apocalyptic anthem as cleanly and as clearly as Ive heard. The vocals, tambourine and pounding electronic bass are all distinct and yet blend in such a way that the listener feels surrounded in the chaos. Of course, a song such as this has even greater emotional impact at high volumes, and it was here that I realized how far I could push the dynamic limits of this speaker. The F12s didnt show the slightest bit of strain as I turned the volume up. Instead, they easily kept pace with the music, and remained composed at levels into which one never need venture. Naturally, there is a point at which the speakers would start to distort, but I never reached it (and I suspect I never even came close). The dynamic abilities of the F12s made them great speakers for rock music, and their ability to reproduce recorded space yields benefits with live albums. Pearl Jams Live on Two Legs [Epic 69752] is wonderfully recorded. You are in a stadium listening to the band, albeit with far better sound than one typically hears at a rock concert. The opening track, "Corduroy," sets the tempo for the rest of the album; the opening notes from the electric guitar are soon joined by the drums and Eddie Vedders raging vocals. Through the F12s, the drums were punchy, bass was tight, and the guitars screeched pleasingly (this is rock after all), making it seem as though I was standing in the front row at the concert. The Revels never strained and always sounded musical throughout the set. This was equally true with recordings of large-scale orchestral pieces, such as the 1975 recording of Carlos Kleiber conducting the Vienna Philharmonic Orchestra playing Beethovens Fifth Symphony [Deutsche Grammophon, 447 400-2]. To truly reproduce the dynamic sweep of an orchestra, a floorstanding speaker is a must. The Revel F12 does this as well or better than any speaker I have heard in its price range. Again, you get the truth from these speakers. So far, I have focused solely on positive characteristics of these speakers. Does this mean that the F12s are flawless? Not quite. Ive heard other speakers that provide even more soundstage depth as well as more detail than the Revels. For example, while Joni Mitchells voice had excellent presence on the F12s, Ive heard other speakers that displayed it with even greater texture and transparency. However, these details are quite minute when one considers everything else the Revels have to offer. And in reality, youll pay quite a bit more if you want to recover that last bit of detail. 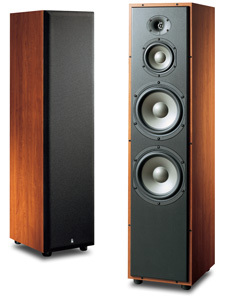 As I indicated earlier, my reference speakers are PSB Image 4Ts, which cost $649 per pair when I purchased them. However, PSB has updated the Image series and replaced the 4T with the T45. Although the 4Ts retailed for about half the price of the Revel F12s, they are excellent full-range floorstanding loudspeakers whose neutral sound makes them suitable for comparison to the F12s. There are a couple of obvious differences between the F12 and 4T. First, because the F12s cabinet is larger and boasts bigger drivers than the PSB model, its no surprise that it can play louder without strain. However, the 4T is no slouch when it comes to sheer output. It can easily fill a medium or large listening room with sound. Much like the F12, the volume at which the sound starts to lose its composure is well beyond anything I can personally tolerate. My guess is that for most people, either of these speakers will be able to play plenty loud. The second difference, and one of immediate note, is that the low-frequency extension of the F12 exceeds that of the 4T. Again, no real surprises here given that the F12 employs two 8" woofers to handle the low frequencies, versus a pair of 5 1/4" drivers used in the 4T. While the bass extension of the 4T is completely satisfactory for all of my listening, those who want to reach the absolute depths might prefer the F12. The biggest difference I noticed in the two speakers was in their vocal presentation. Compared to the 4Ts, the F12s placed vocals slightly further back (depending, of course, on the recording itself), which means that the 4Ts tended to bring them forward a touch. I first noticed this on Loreena McKennitts To Drive the Cold Winter Away [Quinlan Road QRCD102]. On "Snow," the 4Ts place a little more emphasis on McKennitts voice, giving her more presence in the room. With the F12s, however, her voice is more in balance with the sound of her harp, and therefore seems a little laid-back in comparison. I admire the sound of each speaker. Differences such as the ones I've pointed out do not reflect a shortcoming or an advantage in either design, but simply a divergence in philosophy regarding how a speakers sound should be balanced. There is also the matter of value; both speakers are ahead of the curve when all speakers are taken into consideration. At its best, listening to music is a transformative experience. It helps you to forget the daily grind and takes you to another place and time. The goal of equipment used in music reproduction is to get out of the way and communicate exactly what is on the source, whether it be CD, vinyl, DVD or tape. While this is easier said than done, the Revel F12s do a fine job in this regard. I thoroughly enjoyed my time with these speakers. They are easy to drive and, to my surprise, they were easy to place. They are built extremely well and I thought they sounded great with all types of music. The fact that they retail for $1198 per pair makes them an excellent value and a good option for those of us on a budget. So often speaker reviews end this way: "Anyone considering a floorstanding speaker in this price range should take the time to audition this speaker." To this I will add, "Even if you ultimately prefer a different sound, I am fairly certain that you will appreciate the talents of the Revel F12. It's exceptional."